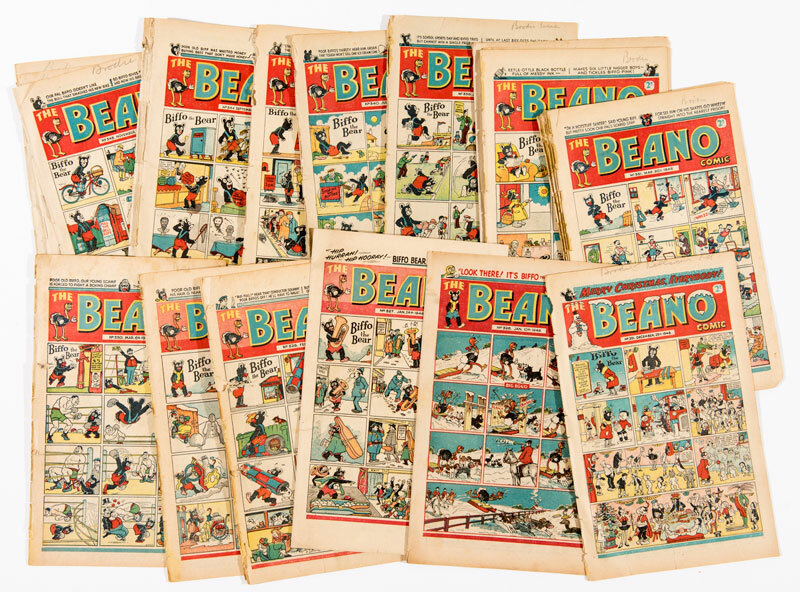 Early Beano issues continue to outstrip previous records with the second issue (less than 10 copies known to exist) at a staggering £4650 with mid grade Nos 3, 5 and 6 at £1280 each. Nos 15 and 16 commanded £1480 each with 19 and 20 over the £1000 mark. 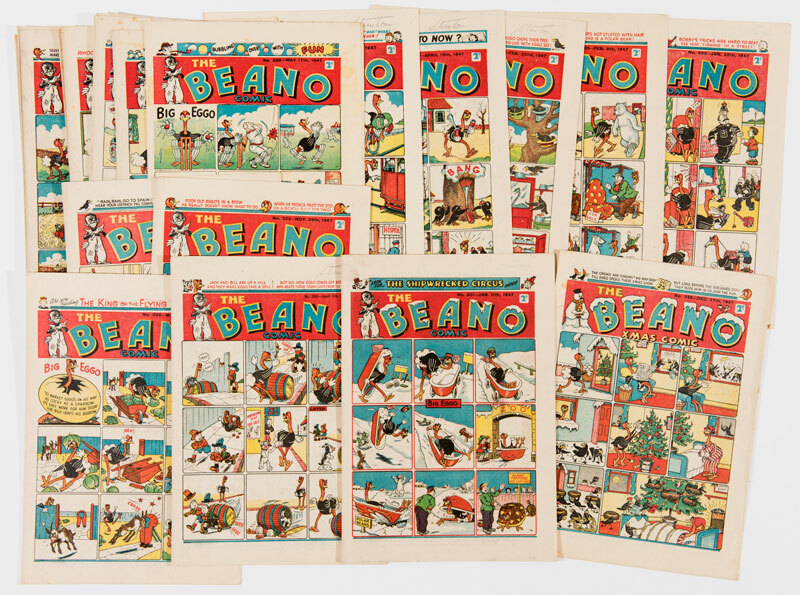 The first Christmas issue, No 21, in highest recorded [vfn] grade soared to £2550 - another huge sum. 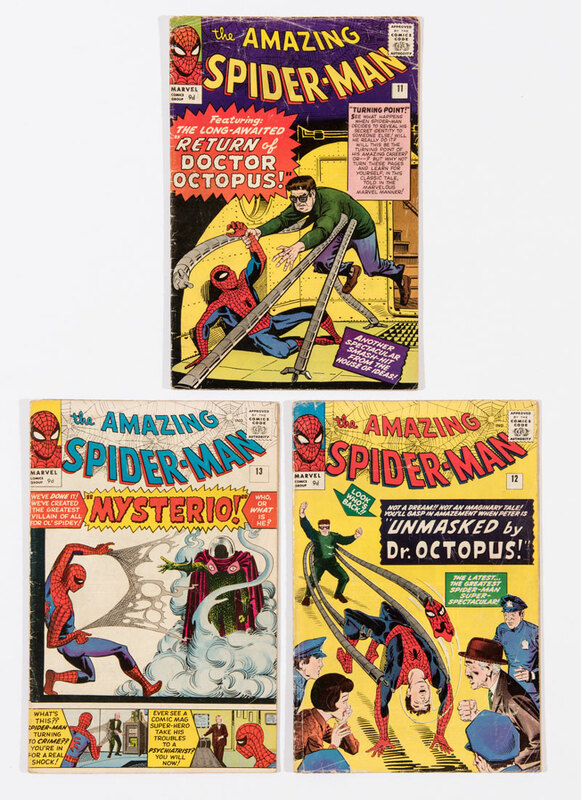 Issues 22-28 in similar high grades were offered separately and all sold in the range of £700-800 each. Wow! Propaganda war years continue to attract strong bids with the complete year of 1944 [fn/vfn] at £1220. 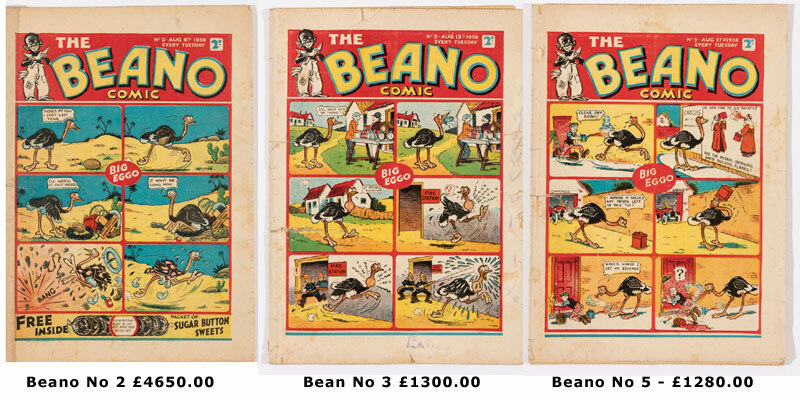 Even later Forties complete years performed strongly with the 25 issues from 1947 at £2300, that’s £92 each. As a complete contrast to 1947, above in [fn/vfn] grades, this complete year from 1948 was retrieved from a bound volume with 3mm trim to the right-hand edge of all pages and resultant [gd] grade. 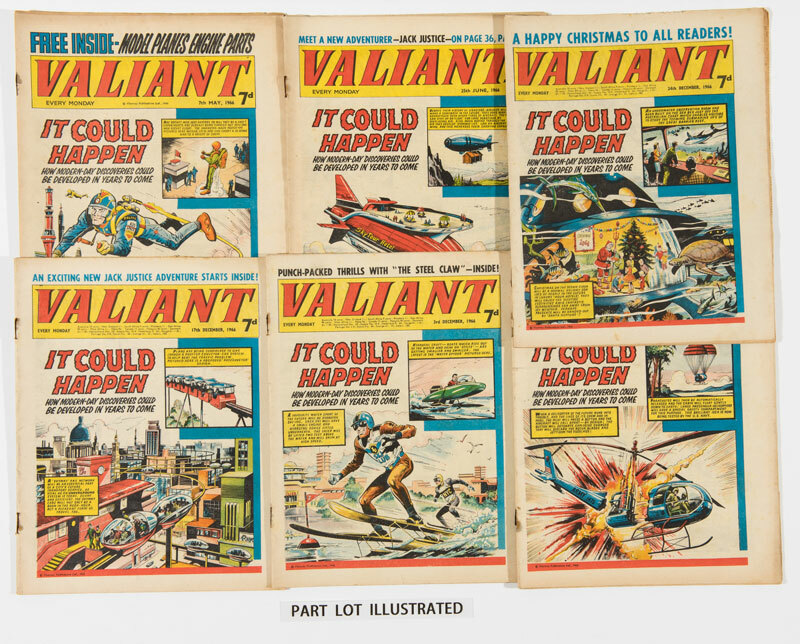 26 issues at just over a tenner each - £270. 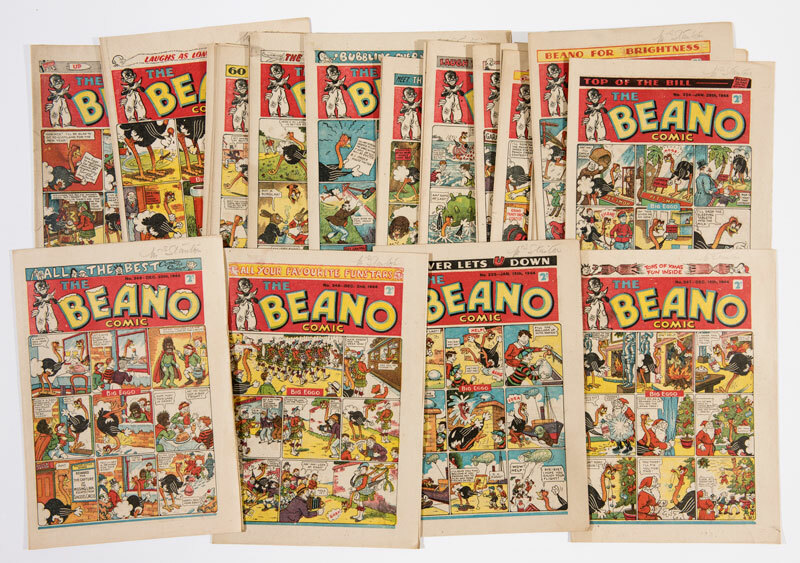 Dandy No 34 had an ad for “A great new fun paper, The Beano Comic, On sale July 26.“ and £210 resulted. A Christmas issue of The Dandy from 1940 with Hitler snowman cover found £350 whilst Xmas 1943 in highest recorded grade registered a strong £580. 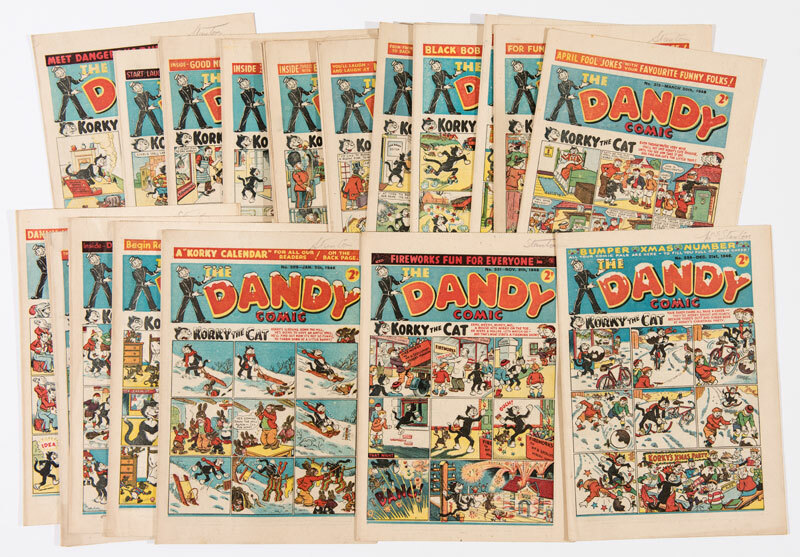 The complete year of Dandy for 1946 included the first issues where Dudley Watkins began to sign his work. £820 was consigned. 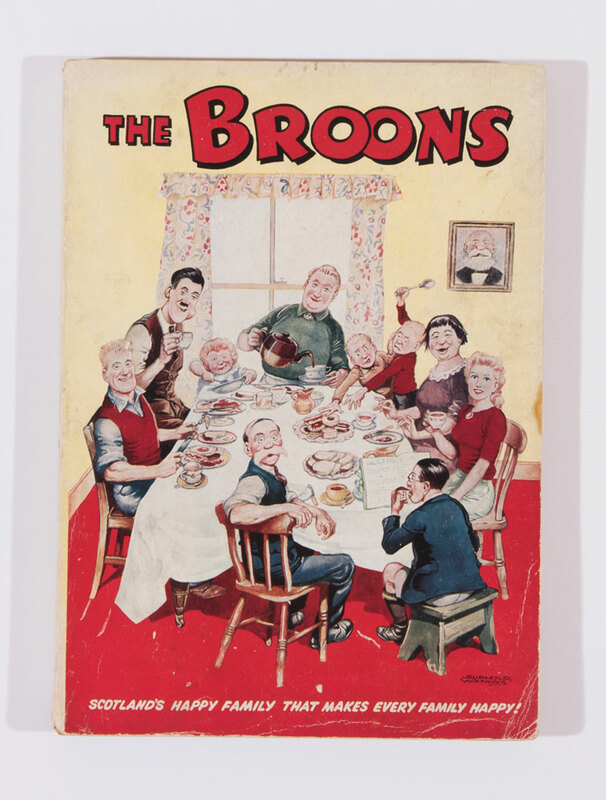 Early Broons Books are always in demand, especially north of the border, and 1952’s Tea time at Glebe Street was repatriated for £460. 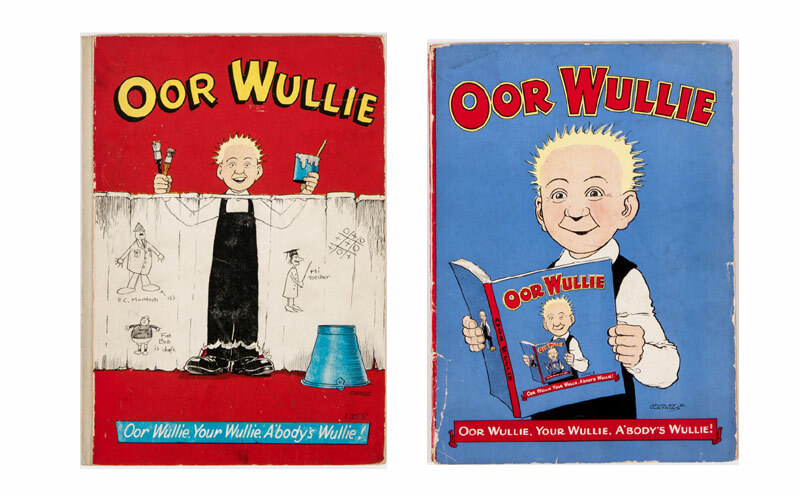 Oor Wullie has just as everlasting an appeal and 1955 with 3 inch torn cover fetched £225 whilst DC Thomson’s 1959 hard-bound reference copy scooped £185. An absolute bargain in your reporter’s opinion. 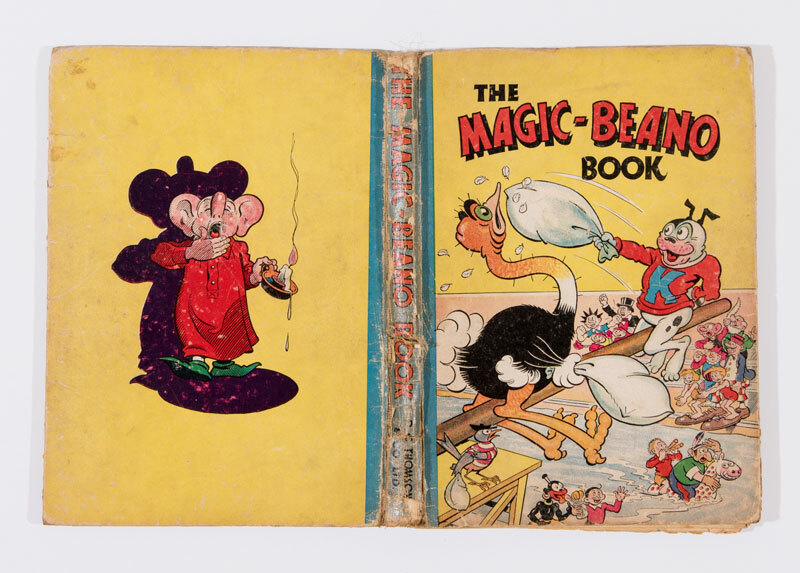 So few of these file copies have ever appeared at auction. 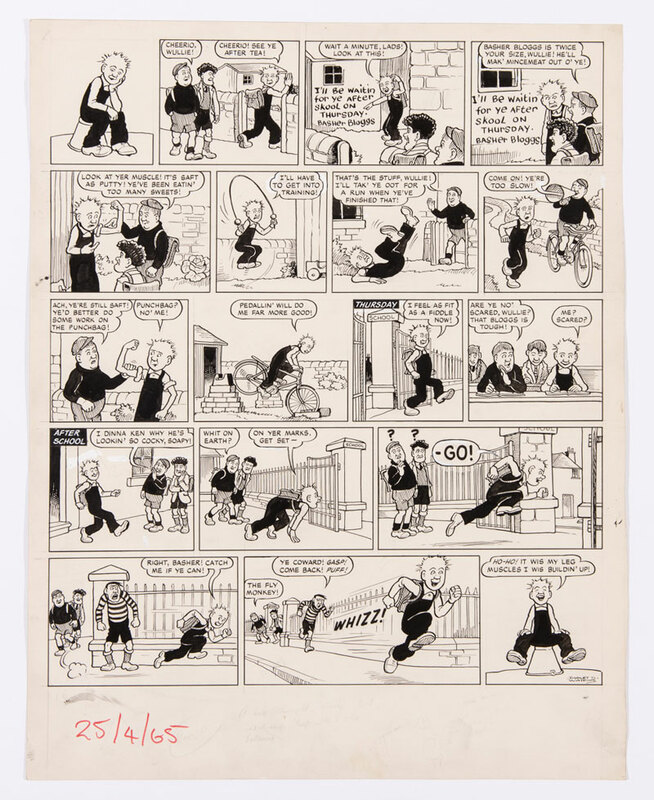 This Oor Wullie artwork from 1965 starred stalwarts Soapy Soutar and Fat Bob with bruiser bully Basher Briggs. The wee lad came through unscathed at £560. 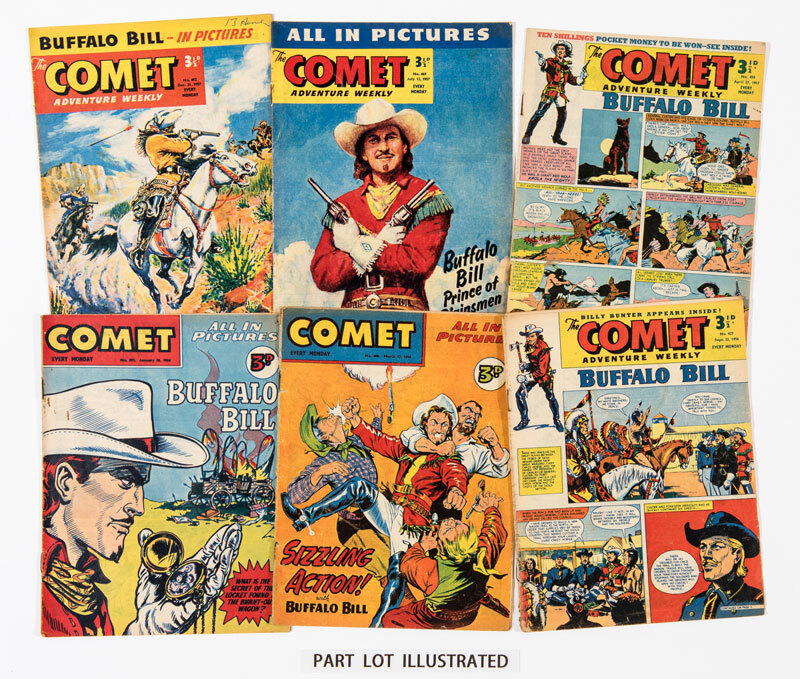 Comet starred Buffalo Bill, Jet-Ace Logan and Claude Duval, who fenced 64 [vg] issues for £330. 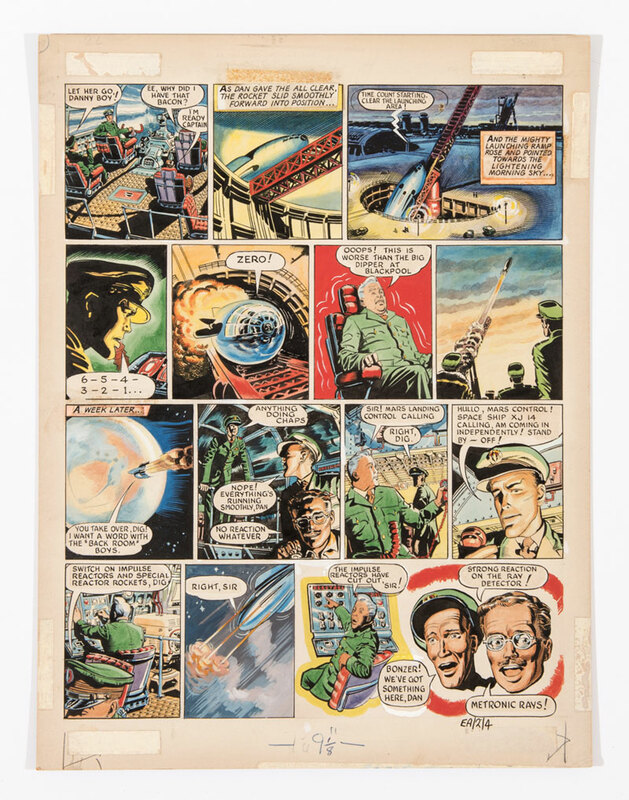 A Dan Dare original artwork board with pencils by Frank Hampson and finished art by Harold Johns and Greta Tomlinson realised £820. 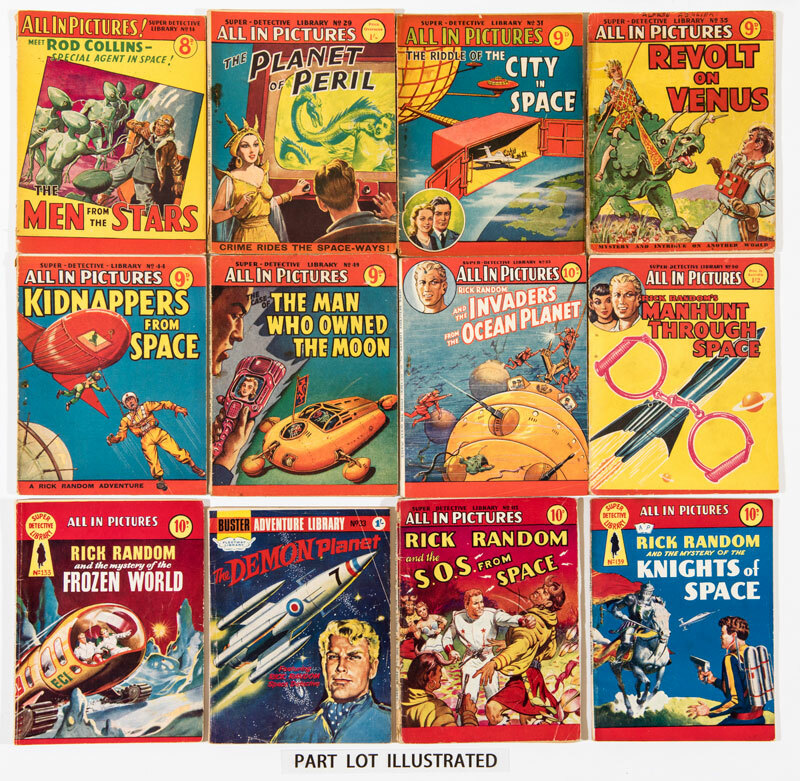 31 issues of Super-Detective Library included a near-complete run of Rick Random Space Detective stories from 1953-59 and a winning bid of £260 reflected this firmly. 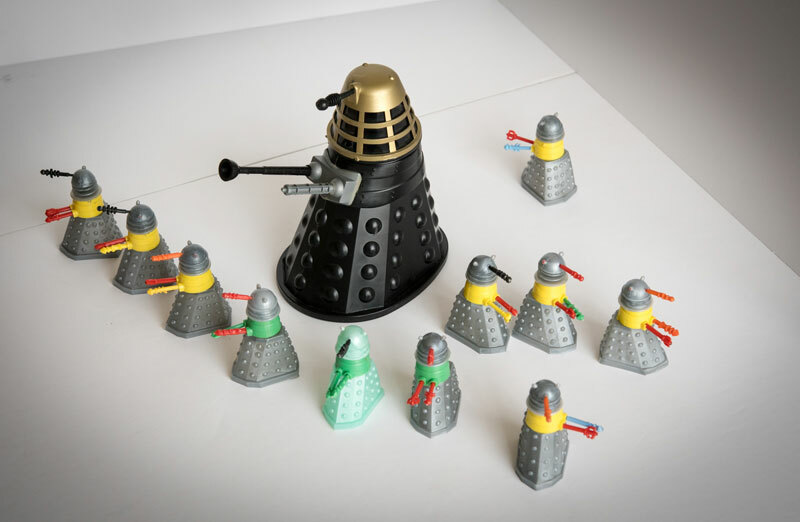 Our Dalek diorama directed £210. 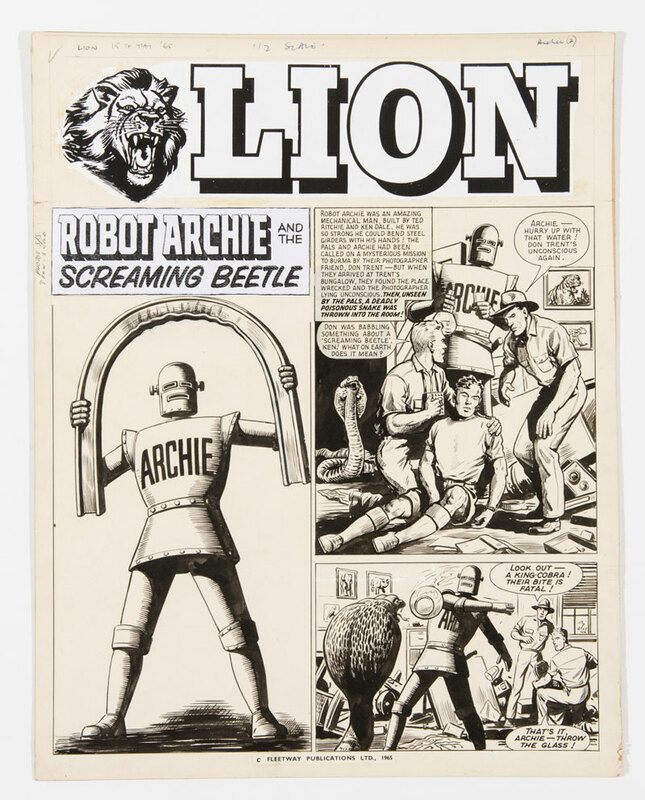 Robot Archie’s original artwork by Ted Kearon for the cover of Lion from 1965 realised £180. 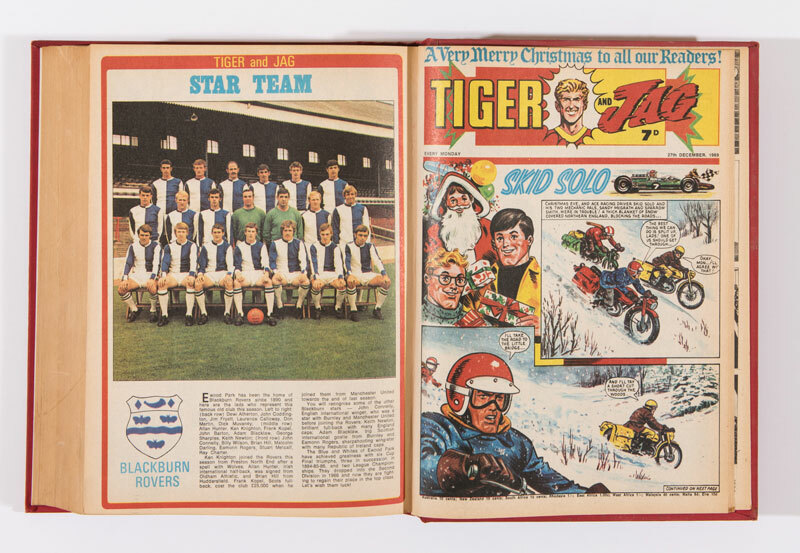 Two bound volumes of Tiger And Jag starring Roy of the Rovers, Skid Solo, Johnny Cougar and Typhoon Tracy stormed to £230. 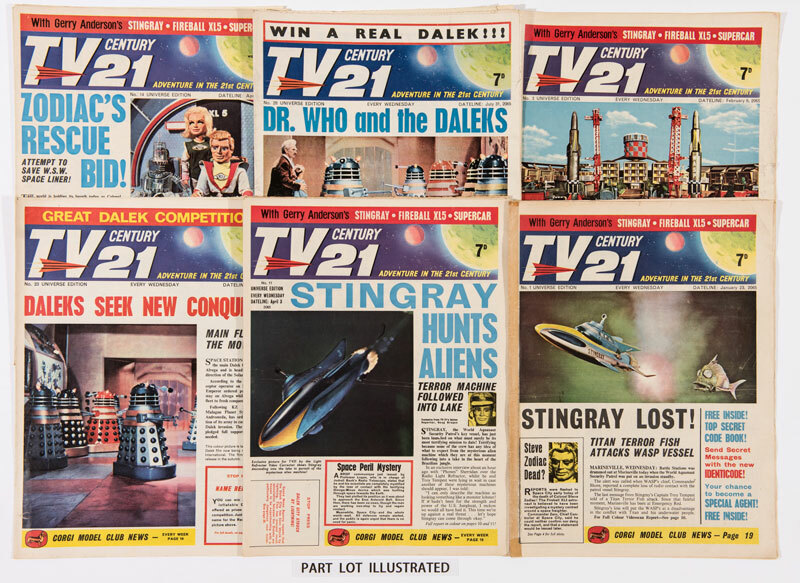 TV Century 21 was offered in issues 1-30 with a number 1 that had spine tape residue in [vg] grade. We were expecting Lady P in a Supercar to come and collect them at £720 but one of our regular unassuming customers won the lot and took them home on the tube using his oyster card. 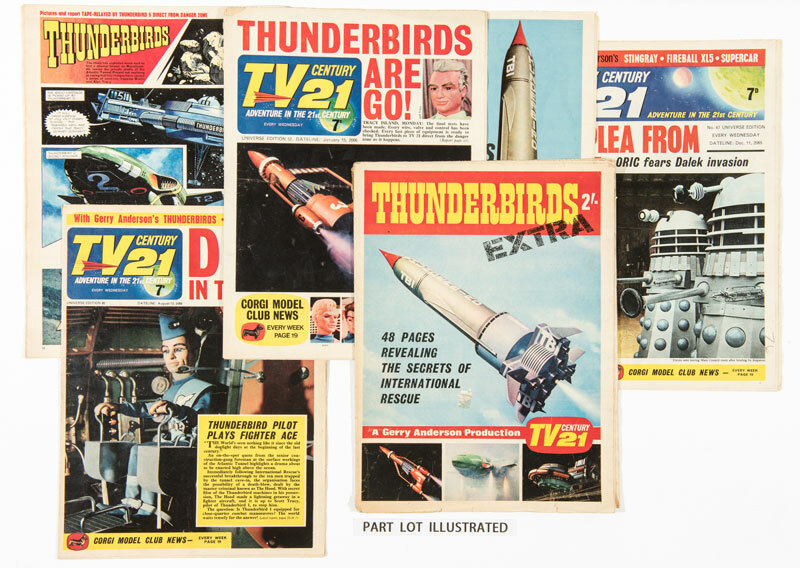 Here were 38 issues of TV 21 between 43-100 with a [vg] copy of the 1966 Thunderbirds Extra – snaffled up for £410. 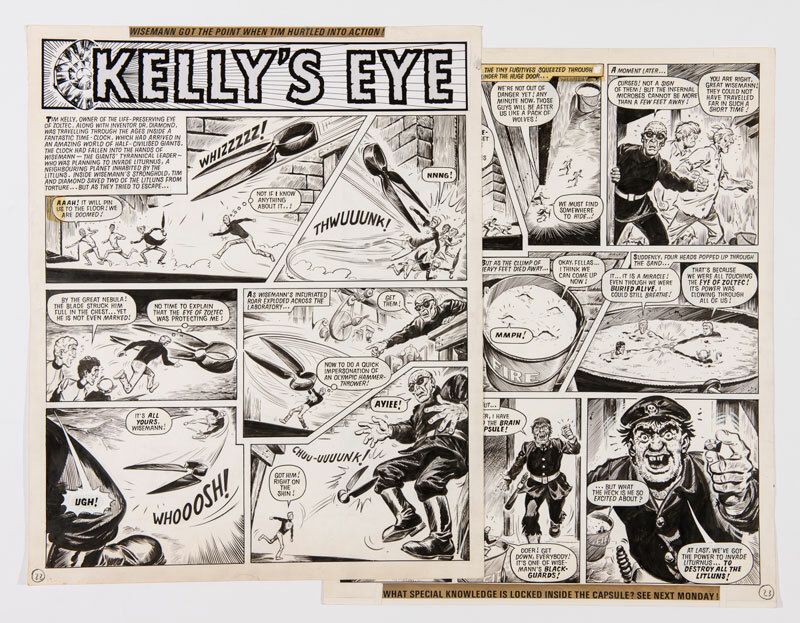 Starring The Steel Claw, Captain Hurricane and Kelly’s Eye, this near complete year of 1966 Valiants made £155. 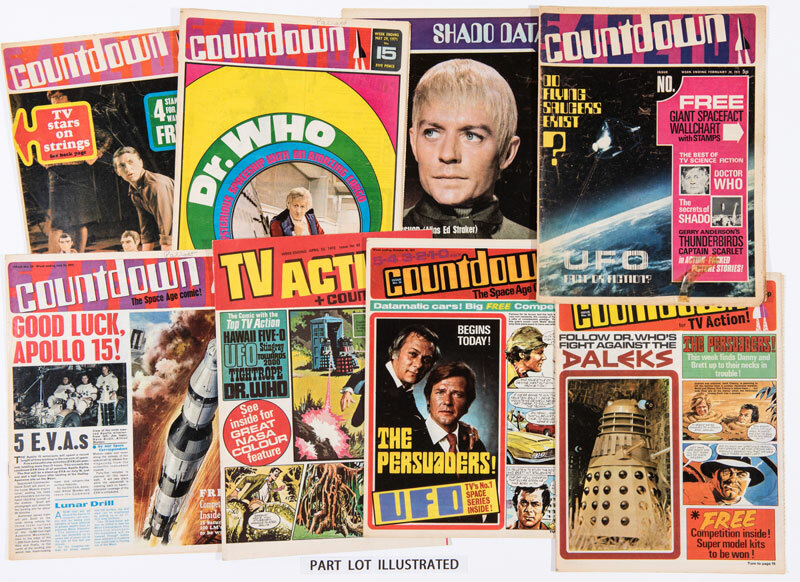 TV 21’s orphan offspring, Countdown, still starred Thunderbirds, Captain Scarlet, Stingray (episodes re-used and re-licensed) and The Persuaders and was offered here comprising issues 1-58 near complete. They counted up £170. 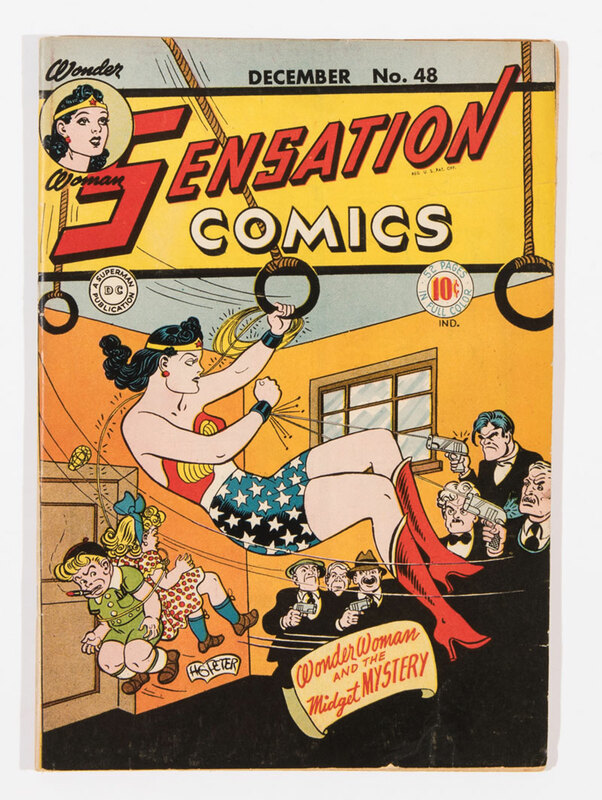 Sensation #48 starred Wonder Woman on its bright, fresh cover and £80 was duly tendered. 3 Whisper glamour magazines with Peter Driben cover art had a photo feature of risqué model, Betty Page. £125 was risqued. 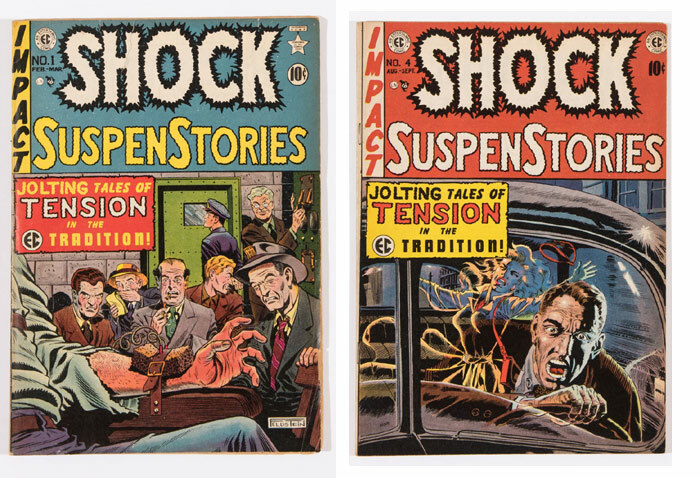 Shock SuspenseStories #1 and #4 were good value at £70 and £145. 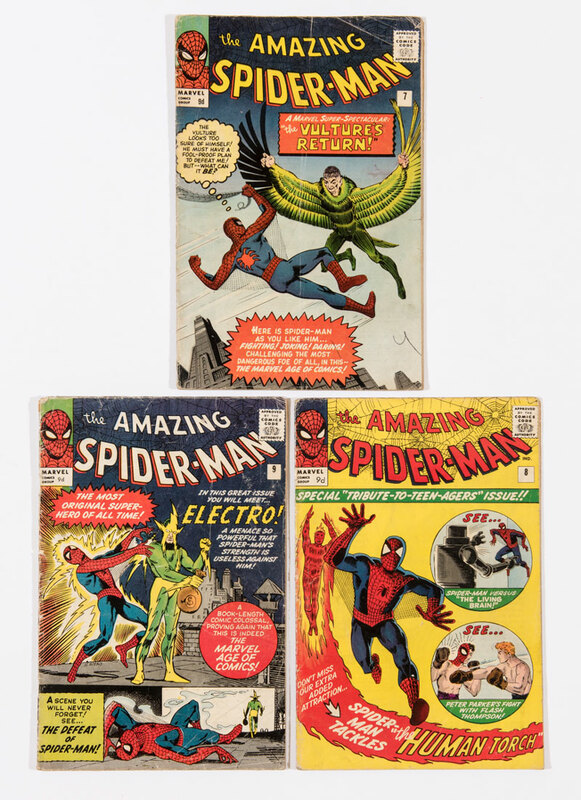 EC’s Vault Of Horror and Weird Fantasy, both #14, were snapped up just below estimate at £105 and £110 respectively. 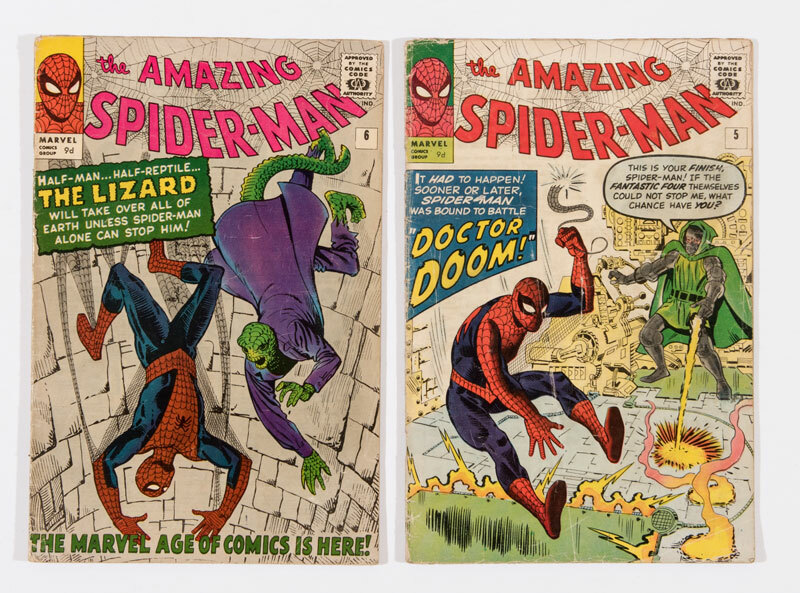 Amazing Spider-Man continues to be the Marvel title of choice. Here #5 and #6 scooped £130 in low grades. Again in low grades, #7, 8 and 9 found £115. 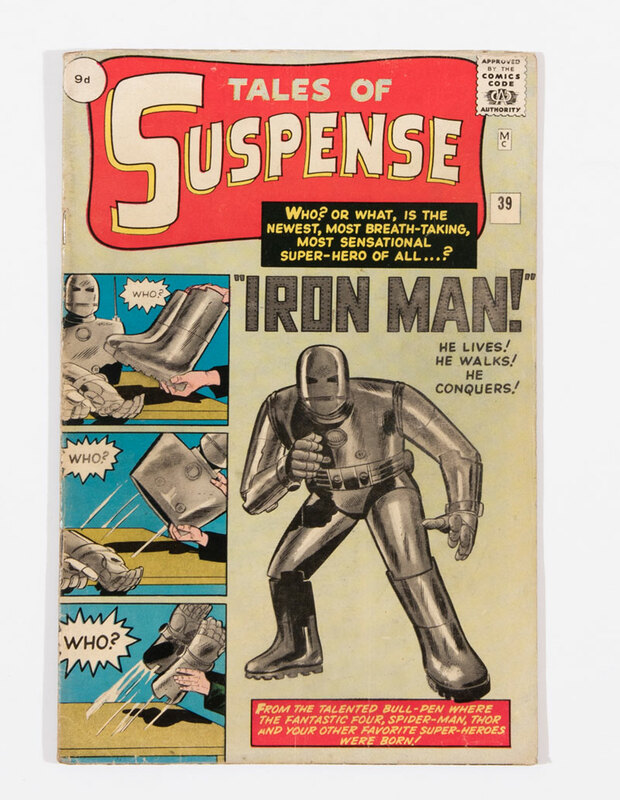 Our Tales Of Suspense 39 was described with no major defects and estimated at £900-1200. 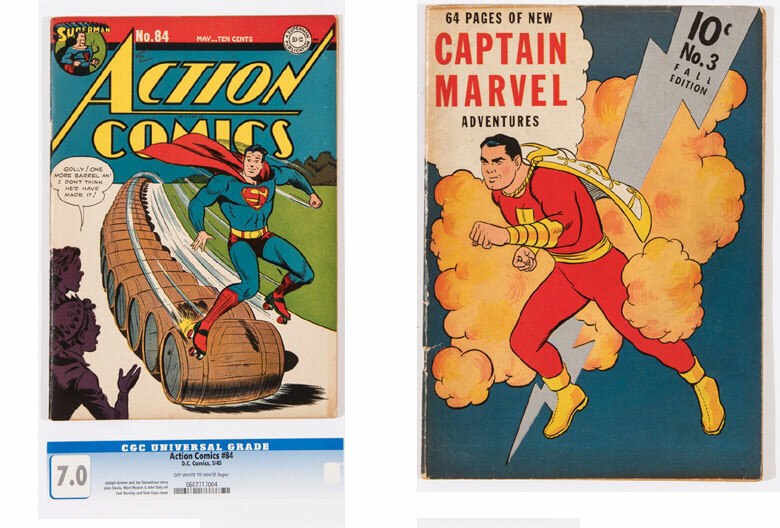 After prolonged, highly competitive bidding, the first Iron Man showed his mettle at £1820. Stark enterprises. I used to be an Iron Man. In the 90s I was in my 40s. I used to be a member of a gym on London’s Park Lane which was situated on the lower mezzanine floor (basement) of a 5-star hotel. With a mix of city types, wealthy hotel guests, local Mayfair residents and people who drove into the West End from Camden Town (me) we were quite a varied but highly competitive bunch (last one in the sauna was always a sissie). You can imagine the foreboding when an ‘Iron Man’ competition was announced by the gym manager to, as he put it, ‘sharpen up’ the members. The contest consisted of 3 timed segments with the winner judged to go the furthest distance over half-an-hour on the bike, half-an-hour on the running machine and fifteen minutes in the pool. All consecutively with no rest in between. Naturally the contestants who signed up for this madness were all twentysomethings apart from two twats in their early forties, me and my pal, Mike. Being outraged by this age-related disadvantage we lobbied the manager for compensation (pathetically 4 days running) and he eventually conceded, offering us an extra 2 minutes in each discipline to level the playing field. Now three weeks training began in earnest with competitors beady-eying each other’s mileage with aloof disconcern as the days relentlessly passed. Of course, none of this was more noticeable than the visceral hatred that developed on a daily basis between Mike and myself as we fought not to acknowledge each other’s efforts. After three weeks of unrelenting torture the competition was 24 hours away when Mike reluctantly pulled out with a knee injury. I could hardly conceal my delight. Nine participants remained. I was ready. A crowd of relatives, friends and gym members with nothing better to do gathered around as I flogged myself on the bike, almost expired on the running machine and searched for plankton near the bottom of the pool. Finally it was over and, laid out on the diving board, I was bathed in luke-warm applause as the manager decided whether to call an ambulance. I came ninth. Mike was thrilled. I used to be an Iron Man.